With both Roo and Tigger, I kept their baby wardrobes quite plain, with nothing that stood out too much. However, when I was pregnant with Piglet it was the bold designs that drew me in. Whilst attending Bumpfest I was introduced to Rockin’ Baby clothing and fell in love with the mix of bold and classical designs available. An ethical company who donate a sling, carrier, or item of clothing to a needy child somewhere in the world. Their ‘You Buy. We Give.‘ campaign has already touched thousands of lives and continues with the support of Rockin’ Baby customers. Knowing how much I love the Rockin’ Baby selection they very kindly sent Piglet a couple of items from their AW16 baby collection. Although she has recently turned one year old, she is still very small for her age and has just starting to move to into the 9-12m size. Opting to order the 9-12m size rather than the bigger 12-18m, I was pleased that I did as the 9-12m was plenty big enough for her. Whilst I do have a thing for bolder colours on Piglet, there is something quite classical about seeing her in baby pink and white. 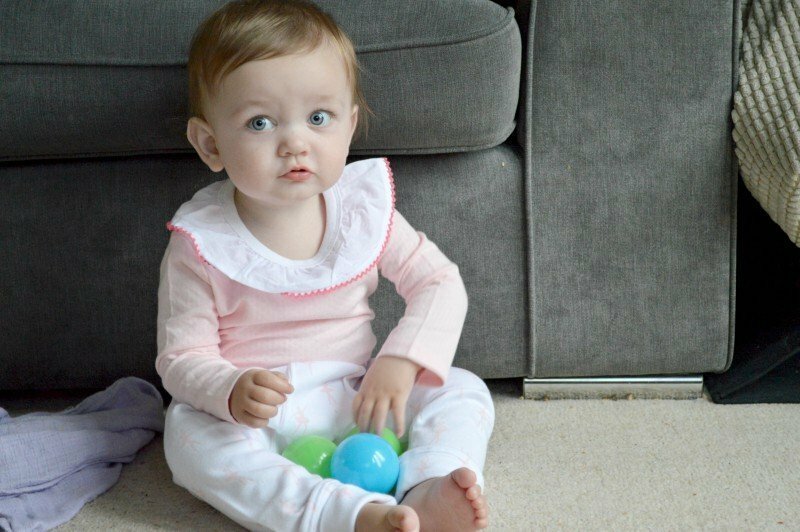 Take the pink long-sleeved babygrow with white frill collar detail, complete with popper and button fastening to the back. It offers the flexibility of being worn as a top paired with a skirt or leggings, or underneath a cardigan or jumper providing that extra layer of warmth in the cold weather. Piglet wears the pink frill collar babygrow paired with the ballerina print leggings which have a generous fit around the nappy area and the turn-up cuff detailing to the ankles means that they can be worn up or down (great for getting that extra bit of wear out of them as little ones grow). Piglet is quite petite for her age so the 9-12m sizing was generous on her, with the leggings slipping down over her feet as she cruised along the sofa etc. This isn’t a big problem, as I simply turned the ankle cuff over one more time to shorten the leg enough for her to walk without tripping. The Rockin’ Baby AW16 baby collection is available from their website and House of Fraser.